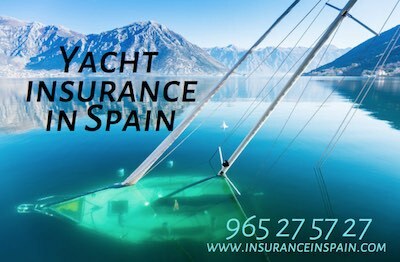 Yacht insurance in Spain from the smallest dinghy insurance to rental boats and megs Yachts - We do it all. YACHT, DINGHY, CREW, CONTENTS AND MUCH MORE AVAILABLE. Buying or owning a Yacht or boat in Spain. Owning or buying a yacht in Spain is often a dream come true. 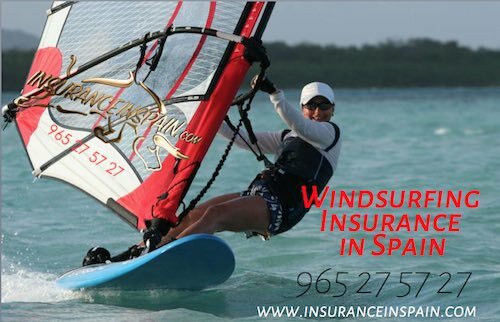 Whether is is registered in Spain or on an SSR registration, www.insuranceinspain can insure your yachts, boats, dinghys, engines, inflatables, crew, contents, electronic equipment and cover salvage and liability. For immediate insurance cover for your Yacht, please call 0034 965275727 now. Our comprehensive range of cover, from the basic legal requirements to covering crew and passengers, is one of the best on the market in Spain. Policies are also in English and we can advise you on other aspects relating to Yachting insurance and the correct cover needed. With hundreds of beautiful mooring locations all around Spain and with the gentle warm climate most of the year round, it is no wonder that most of the Marinas and mooring areas within Spain are virtually filled to capacity. Bringing your own boat or yacht to Spain. Many people will bring their own yachts, sailing dinghys or boats to Spain as they are permitted to fly under the Small Ships Register flag provided the owner is not a permanent resident. If you are a permanent resident of Spain, or plan on becoming one, be aware that importing your yacht or boat is not a simple task and can prove very expensive, particularly if you plan on using a trailer to launch and retrieve it. You can only tow a British made or manufactured boat trailer, behind a British registered vehicle. As most Britisah registered vehicles, trailers and boats can only be here temporarily, you will need to consider importing it if you are likely to be here more than 90-180 days. Britsh Registered boats and Trailers. 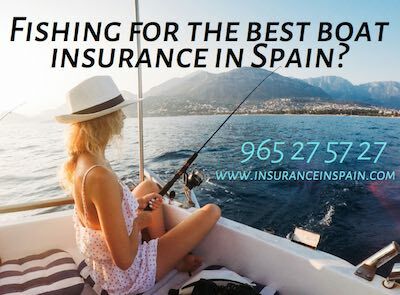 Yes, we can insure them without a problem and more often than not, the boat and trailer insurance in Spain is considerably cheaper than those of the UK and the boat insurance policies are in English so you can take the time and read through the cover. As we insure many boats all over Spain, we have the expereince and knowledge that ensures you are covered correctly. Some people do keep SSR boats here in Spain and there is not an issue with that, provided they are kept in a Marina, whether stored or moored, insured correctly and have all the correct paperwork and safety equipment on board such as Flares and lifejackets. Towing boats with British trailers in Spain. The Spanish authorities do not like trailers. Get stopped towing a British made or registered trailer behind a Spanish vehicle and you are in for a big fine and the possibility of them confiscating your boat, trailer and car! Even if you tow it with a British registered vehicle, if it is a british made trailer, you will have to import it if you are intending to stay here for more than a couple of months. Most boat trailers under 750 KG can be added free of charge to your car insurance policy, and for trailers over 750 KG, we have a bespoke insurance policy to cover you. Importing your boat is not so difficult, but the costs will depend on what you have, how much safety equipment you have on Board and the boats value. Importing the trailer is another story. If you can buy a Spanish trailer, then do, it makes things so much easier. Importing a UK made trailer will probably cost you as mush as a new one anyway. Bear in mind that most trailers over 250Kg do require an annual equivalent of an MOT (ITV). Trailer have to have the EU conformity certificate, the original purchase invoice and conform to other EU requirements. You will need to check with the local Spanish authorities where you plan to stay to see what they actually do need as it varies between the 17 Autonomous regions in Spain. Importing your boat is quite easy but can take time. You will need the correct boat licence and the boat may need to be inspected and carry all of the correct equipment such as a life jacket for each person on board, Signal and emergency flares, a reflective disc, a bell, a bailing bucket , a flag, and signal cards, and a life ring. If and inspection is required to check the integrity of the craft, the hull, engines, etc, one will be appointed and sent to see the vessel. Re-testing or certifying a 6 meter vessel that is already on Spanish plates can cost between 800-1200€. The bigger the bost the more it goes up. There are Gestors in Spain that specialise in the importing and registering of boats and i would highly recommend that you talk to these people, BEFORE you bring in or buy a boat in Spain. Transferring a Spanish registered boat into your own name. Again, we would highly recommend to speak to a qualified Gestor before parting with any money. An average 6 meter boat with an outboard engine of 70 hp which is 10 or more years old, can cost up to 1200€ and will depend on the age and value of the boat. The bigger and better the vessel, the more it is going to cost. Bear in mind that it will also need to comply with all safety regulations, and have all lifejackets etc in date. You will need to get all of the correct documentation from the previous owner. There are seperate pieces of paperwork for the registration of the engine* and the boat and the trailer. Without any of these you will be hard presssed to get it registered and into your name. Most Expats buy local SSR registered boats or bring in their own. Ownership transfer costs are a simple 25 quid online, with the small ships register. You will need a permanent british address to do this. Spanish vessels are also categorised for the areas where they can be used. Up to 5 miles offshore, 12 miles offshore and offshore. Each category requires a different type of registration. * If buying a second hand boat, check that the engine plate numbers match with the paperwork as engines are often replaced and the paperwork is not completed. All engines new or old, need the corect paperwork. This is not a requirement for insurance purposes. Depending on the size, but generally anything on the water will require a proper boat licence. RYA and similar licences are accepted and if you don`t have one, there are some reputable RYA boat licencing centres along the coasts and the licence only normally takes a day and can cost anything up to 400€. The basic sports boat licence will permit you to use any craft up to a maximum of 10 meters in length. Small craft under 4 meters with an engine under 14 hp do not normally have to be registered, but again, check with your local area as marinas like Denia are now requesting registration for these smaller craft. Sea fishing and boat fishing licences. Bet you thought you could just hang a rod over the side and do some fishing! Not in Spain you can't. Don't risk getting caught as the fines are far worse than the fishing and rod licences. (They can confiscate all your fishing tackle and you can pay in excess of 300€ each for the fine and have great difficulty in getting you tackle back.) For about 50€ you can get a boat sea fishing licence for 2 fishing rods, and this is normally done when you import or transfer a boat into your name. If you are using an english registerd (SSR) boat, then you can buy the fishing licence on line or go into a RURAL CAJA bank and get one over the counter. It can take a couple of weeks, so plan ahead if you want to go sea fishing. If the boat is Spanish registered, don't forget to have the sea fishing permit added to it. A useful tool when selling the boat as the licence is allocated to the boat, not the owner. This might seem a bit strange, but you must keep all permits, documents etc on board and they must be the originals and they must be up to date. Not having your current, valid insurance documents on board will net you a 300€ fine. As long as you do things correctly and behave on the water you should not have any issues with the local authorities. Always make sure you have a plentiful supply of fresh drinking water and have a charged mobile phone or ship to shore radio and if you plan to stay out after dark always let someone know. Fuel, water and often supplies can be found in most Marinas. There are a lot of beaches and coves along the vast coastline and you may be tempted to pull in and have a bite to eat or a drink. If you have a ship to shore radio call the Marina and ask for a temporary berth so that you can have lunch or whatever, as a courtesy, most speak English and are usually happy to oblige. They may not be so friendly if you just turn up and moor your boat and wander off. Most beaches and recreational areas along the coastlines do have a series of yellow bouys marking the boundaries that restricts boats from entering. These are to protect the swimmers and bathers. Do NOT enter into this area unless you have an emergency. In the wintertime, most of these places are accessible, provided there have removed the yellow containment area bouys. Finding a mooring in a Marina is virtually impossible during the summer and they tend to be very expensive. If you are planning to leave your boat in a Marina during June, July, August or September, make the booking and confirm it as early as you can. If you have a boat on a trailer, they will permit you to launch, for a fee, usually 20€ a day. Some will not let you keep the trailer in the Marina whilst you are on your boat, so please check. Speed limits within the Marinas are usually set at 4 Knots. Storage at a Marinas is now very limited and several companies are now offering excellent storage and service facilities away from the Marinas. Not that they are any cheaper. Our advise would be to seek personal recommendations as to whom to use as there are a lot of murmerings about boats not being winterised properly or serviced correctly after storage. If you know how to winterise your boat, then do it yourself and you won't have any issues when you come to use it next year. Sun, sea and Sangria sounds like an excellent mix! You can still be breathalised and fined for driving a boat under the influence of alcohol or drugs, so seek moderation or have an appointed driver. Lifejackets, liferafts, flares and safety equipment. These are some of the most essential safety equipment on your boat. Make sure they are up to date, easily accessible and that everyone knows where they are kept before going out to sea. Everything may seem very nice and calm when you leave and i know from personal experience that that can change very rapidly, so be aware and be safe. www.insuranceinspain.com offers this infromation as a guideline only, from personal experience and some information may not be pertinent to some areas of Spain. We would like you to enjoy your boating experiences in Spain and to be insured correctly so that you do not encounter some of the issues that we have had to deal with in the past. We offer all types of insurance from the basic minimum legal requirements and we are more than happy to talk you through and advise you on the best products and policies to use. We are staffed by humans that enjoy what we do, so give us a call on 965275727 if you hae any questions. Copyrights and all rights reserved. www.insuranceinspain.com November 2017.